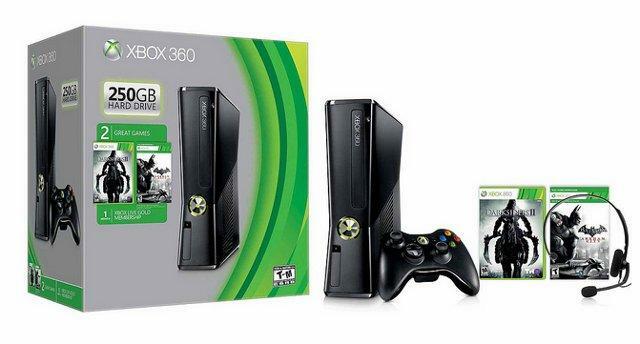 Looks as if another Xbox 360 bundle is headed our way before the current generation is up, so be warned. Larry “Major Nelson” Hyrb announced on Thursday afternoon that a new spring value bundle for the current-gen Xbox is headed out the door – and into retail – starting on the eve of the ides of March 2013. To put it in simplified terms, you get 250 GB worth of hard storage, a free month of Xbox Live gold-level services, a wireless controller and a pack-in copy of Darksiders II, along with downloadable redemption for Batman: Arkham City. Pricing is standard fare regarding what you get besides the free games, as well. Of course, at this stage in the game (which I intended to say, mind you) one has to wonder if it’s worth getting the current-gen Xbox when the next step up is rumored for a mid-spring unveiling to begin with. Furthermore, unless you’re still one of the more unlucky saps with an Xbox model that’s potentially susceptible to E74 or the infamous red ring (and heavens forbid such a thing would still be possible), or are simply fearful of possible anti-used games tech in the next model, then by all means go for it should you be so inclined to. It’s not like Microsoft is forcing you to wait for the new Xbox to arrive before you make the jump. And besides, it’s not like the Xbox Live tech will be immediately switched off for the Xbox 360 anyway judging by history itself.